Remember the earlier blog about the lawsuit brought by shoe designer Christian Louboutin against Yves Saint Laurent for infringement of Louboutin’s red sole? Despite Louboutin’s U.S. trademark registration for its red sole, and substantial evidence that the red sole had gained secondary meaning, Louboutin was denied a preliminary injunction against YSL last year that would have prevented YSL from continuing to sell four styles of red-soled shoes. In denying the injunction, the lower court judge ruled that Louboutin was unlikely to win the infringement case on the merits as its trademark claims were overly broad. Louboutin immediately appealed this decision and in early September, the 2nd Circuit Court of Appeals found that Louboutin does have valid trademark rights in its red soles, when those red soles contrast with the color of the rest of the shoes. That’s a win for Louboutin, right? Yes. Sort of. The validation of Louboutin’s trademark rights is absolutely a win. But it’s also a win for YSL as the four styles of shoes that it sells with red soles also have red uppers. So we have two winners – for now. Louboutin keeps its trademark – with limitations – and YSL continues to sell its red shoes with red soles. The case now goes back to the lower court for review and consideration of some YSL counterclaims that were not part of the earlier decision and appeal. While Louboutin is having some luck with its trademark in the United States, it was not so fortunate in a similar lawsuit it brought in France against Zara, a successful “fast fashion” Spanish clothing and accessories retailer. (“Fast fashion” is a term that refers to retailers that move designs quickly to stores for the mainstream consumers.) About the same time that Louboutin brought its infringement suit against YSL, it also tried to prevent Zara from selling a red-soled shoe, on the grounds that the Zara shoe (selling for $70) might create consumer confusion with the Louboutin shoes (a bargain at 10 times the Zara price). The European Union, and France in particular, has generally been more favorable for protecting fashion, so it’s not surprising that the French judge initially favored Louboutin in its case against Zara. But ultimately, Zara was persuasive and the court decided that Louboutin’s trademark registration for red soles was too vague, and even suggested that Louboutin should specify a Pantone number for its particular red. That decision was upheld on appeal, and although Louboutin was required to pay a modest amount to Zara (about $3,600 U.S.), the real cost to Louboutin is the potentially weakened nature of its trademark. While I am not so certain about the legal analysis supporting these various decisions, I admit that the results coming out of this messiness actually make sense. The fact is that the red sole of the Louboutin shoes is recognized for its source, and that is a primary function of a trademark. At the same time, no one wants to allow broad color monopolies, particularly in fashion where color serves other purposes. 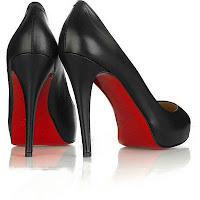 Although we don’t yet know the final court decision in the U.S., I suspect it will follow the appellate ruling and confirm Louboutin’s trademark rights in the red sole, but appease the fashion world by excluding monochromatic shoes. To watch for, however, is whether the U.S. court will go further and prescribe a particular Pantone number for the Louboutin red (doubtful), or at least suggest that Louboutin’s trademark rights are limited to its current signature red lacquer.